The contemporary chamber music ensemble, chatterbird, along with its Composer in Residence, Wu Fei, received a prestigious MAP Fund award for the 2018 cycle, totaling $27,004. The grant will support the composition, workshopping and premiere of Wu Fei’s large-scale work, Hello Gold Mountain, for chamber ensemble featuring guzheng and oud, two traditional instruments of Chinese and Jewish cultures. The work will premiere at Vanderbilt University’s Ingram Hall on Saturday, February 23, 2019. Hello Gold Mountain is a requiem for lost possibilities of the Jewish community of Shanghai. The work, an original composition by Wu Fei, will feature chatterbird along with Wu Fei (guzheng) and Silk Road Ensemble’s Shanir Ezra Blumenkranz (oud). The piece is inspired by stories of Jewish refugees who fled to Shanghai from Europe during World War II. From 1933 until the end of the war, Shanghai was often the only port at which Jewish refugees fleeing Europe could disembark without a visa. In the early 1940s, more than 20,000 Jews lived in Shanghai and contributed to its cultural and civic life. But the Jews could not stay. As China’s bloody civil war came to a close in 1949, most fled. Many emigrated to the US, often arriving at the port of San Francisco, or Old Gold Mountain 旧金山. What musical possibilities were lost because the times did not allow neighbors from these different cultures to grow old together, sharing songs and stories? Similarly, what artistic creations will be lost if Europe and the United States close the door to refugees and migrants from lands in chaos? Chatterbird will partner with the Tennessee Immigrant and Refugee Rights Coalition (TIRRC), Chinese Arts Alliance of Nashville (CAAN), and others to present a range of historical and educational workshops. As the project evolves, updates and schedules of related activities can be found here. Over 800 applicants across the United States submitted proposals for the 2018 grant round. MAP granted 40 awards. Past grantees of the MAP Fund in the Music Composition category include Kronos Quartet, Alarm Will Sound, International Contemporary Ensemble, Bang on a Can, PRISM Quartet, American Composers Orchestra, and eighth blackbird, among others. On the work, composer Wu Fei says, “I am thrilled at the opportunity to bring this work to the world. By highlighting these stories through music, we will advance a mission of cultural understanding and humanity." The MAP Fund supports original live performance projects that embody a spirit of deep inquiry. In particular, MAP is interested in supporting artists that question, disrupt, complicate, and challenge inherited notions of social and cultural hierarchy across the current American landscape. Annually, MAP awards over $1.2 million to up to 40 projects. The MAP Fund was established in 1988 by The Rockefeller Foundation to support innovation and cross-cultural exploration in new works of live performance. Since 1989, the program has disbursed over 27 million dollars to more than 1000 projects in playwriting, choreography, music composition, and ensemble, site-specific, and community-based performance. The MAP Fund is primarily supported by the Doris Duke Charitable Foundation. Additional funds come from the Andrew W. Mellon Foundation. Born and raised in Beijing, Wu Fei is a composer, vocalist and performer of the guzheng (Chinese zither), as well as the piano. She began performing guzheng at the age of six, and spent her formative years studying composition at the China Conservatory of Music. She holds an M.A. in Composition from Mills College where she studied improvisation and composition. Wu Fei has performed and recorded with musicians such as John Zorn, Fred Frith, Billy Martin (Medeski-Martin-Wood), Carla Kilhstedt (Tin Hat Trio), and Grammy winning musicians Jeff Coffin, Abigail Washburn and Béla Fleck. Her commissions range from a composition for the Percussions Claviers de Lyon (France) that premiered in the Forbidden City Concert Hall in Beijing, to live performances in Paris and Tokyo for Hermès. She has composed for Balinese gamelan, symphony orchestra, choir, string quartet, chamber ensemble, film, and modern dance. Fei has performed at The Great Hall of The People in Beijing, EXPO 2010 in Shanghai, The Stone and MoMA in New York City, Herbst Theatre in San Francisco, Big Ears Festival in Knoxville, North Sea Jazz Festival in the Netherlands, Vossa Jazz in Norway, Europalia in Belgium, and Madame Guitar Festival in Italy. Fei has also been a guest lecturer and performer at institutions including China Conservatory of Music, University of North Carolina in Chapel Hill, and The Norwegian Academy of Music in Oslo. 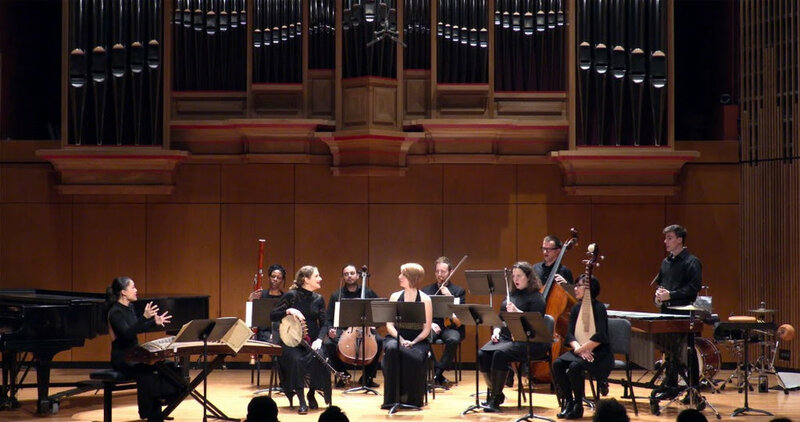 chatterbird is a chamber music ensemble that explores alternative instrumentation, stylistic diversity, and interdisciplinary collaboration in order to create thoughtful, intimate, and inventive musical experiences. Formed in 2014, chatterbird performs classical music that skirts traditional boundaries, sliding between classical, jazz, hip-hop, rock, avant-garde, and country, creating a thoughtful and inventive way to discover and experience modern classical music. chatterbird brings cutting-edge chamber music repertoire into spaces where you wouldn’t usually find it, like bars, galleries, breweries, basements, and everywhere in between. At the Big Ears Festival in late March 2018, The Rolling Stone Magazine reviewed Wu Fei for the second year in a row among its top picks of the entire festival that hosted more than a hundred performances from all over the world. WSJ also reviewed Fei's performance from this year's Big Ears Festival with her improv group playing her Tea Garden Ceremony improv piece. 2. Big Ears 2018 on WSJ "Wu Fei, master of the guzheng, a Chinese zither, jammed with jazz musicians"
Wu Fei is on Red Bull Radio today https://www.redbullradio.com/Headphone Highlights show premieres at 10 AM EST and will re-run at 10 PM EST, as well as several times over the next couple of weeks. You can check their current schedule here: https://www.redbullradio.com/schedule. Big thanks to Red Bull Radio for providing me such a great time and platform to tell the whole world about the things I’m passionate about! Thanks to DJ Mark Frosty's great questions (of dublab, afellow curator of The Stone NYC)! Wu Fei is excited to announce her newest partnership with Nashville-based alternative classical ensemble chatterbird - as their composer in residence.